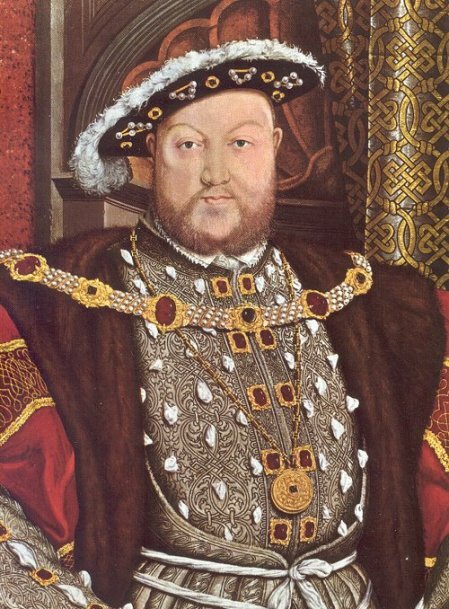 There are two reasons for King Henry VIII’s persistent fame – the fascinating history of his reign, and the artistic genius of Hans Holbein the Younger. 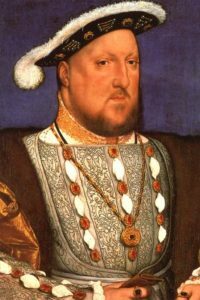 If Henry had been immortalized by a lesser artist, it is likely that even six wives and the Reformation would not have ensured his place as the most recognizable monarch in world history. 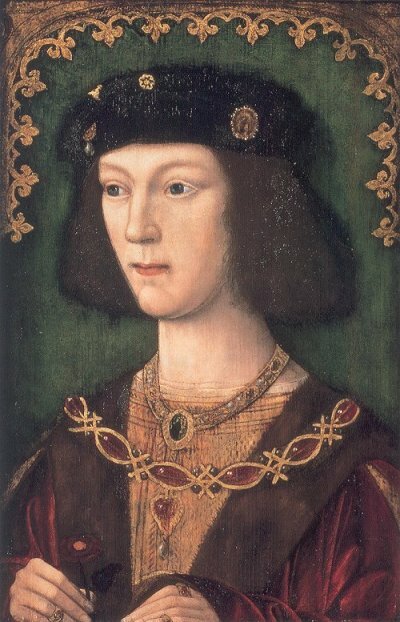 Henry was born in 1491 and was crowned king at the age of 18. He immediately married his brother’s widow and entered into the tangled web of European politics. Despite vast sums of money, much diplomatic wrangling, and several battles, his foreign policy was mostly inconsequential. His domestic policies, however, changed the course of English history. Determined to annul his first marriage, Henry eventually rejected papal authority in England. In 1535, he declared himself Supreme Head of a new English church; the Reformation had arrived in England. He proceeded to marry five more times; two of those wives were executed. When this ‘serene and invincible prince’ died in 1547, he bequeathed a bankrupt and bitterly-divided nation to his three heirs. Below are some of the well known surviving portraits of the Tudor King Henry VIII in chronological order. 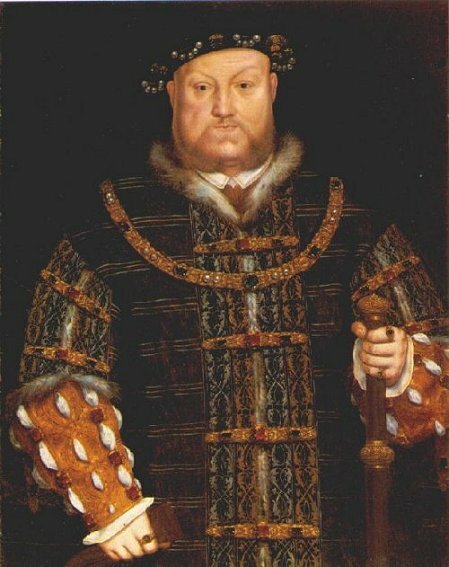 Henry VIII, c1509, unknown artist. 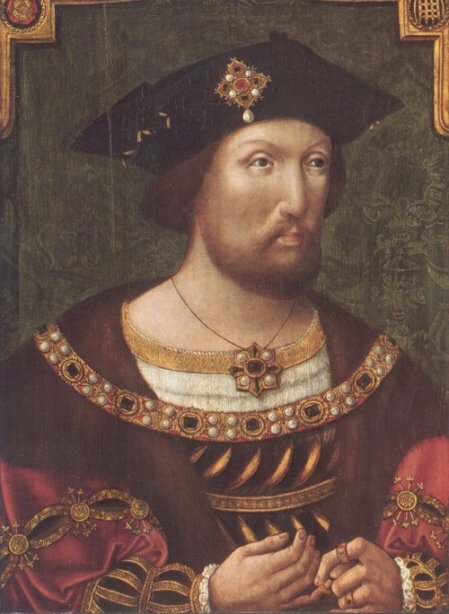 This is the earliest surviving portrait of Henry as king of England. It can be viewed at the Denver Art Museum. 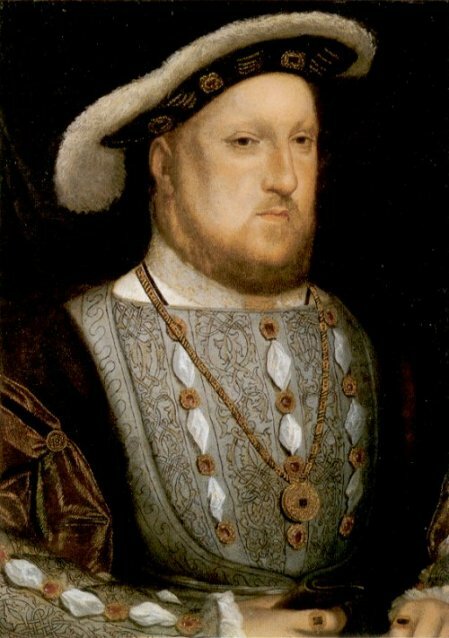 Henry VIII, c1520, unknown artist. This beautiful portrait shows the king placing a ring upon his right hand, a symbol of his devout piety. 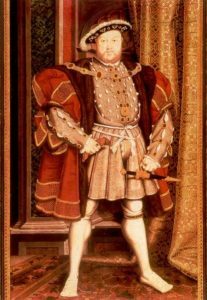 Henry VIII, c1535, attributed to Joos van Cleve. This is my favorite portrait of the king. It was painted during his brief marriage to his second wife, Anne Boleyn. The king is physically more attractive than in the later Holbein portraits. Henry holds a scroll inscribed ‘Go ye into all the world, and preach the Gospel to every creature’ (Mark 16.15). This portrait is part of the Royal Collection. 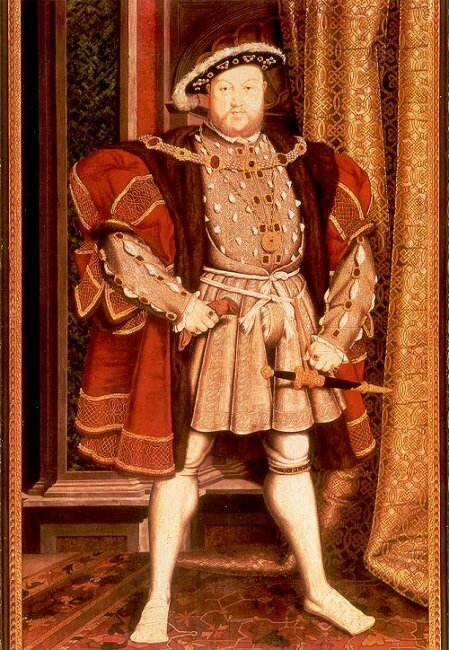 Henry VIII, c1536, by Hans Holbein the Younger. This is the quintessential portrait of Henry VIII. It is perhaps the earliest image of the king by Holbein. It is so beautifully detailed that close inspection is necessary. The cloth of gold sleeve and the intricate pattern of the cloth of silver doublet are perfectly done. Real gold was used to detail the sleeve and the king’s jewelry. 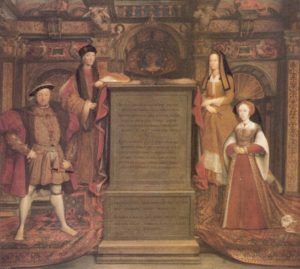 The portrait was done around the time of Anne Boleyn’s execution, in the midst of the dissolution of the monasteries and before Henry’s long-awaited son was born. The king’s figure and magnificent apparel are proof of his authority. But Holbein’s portrait is not flattering; Henry appears guarded and suspicious, and quite unapproachable. This portrait is part of the Thyssen-Bornemisza collection. 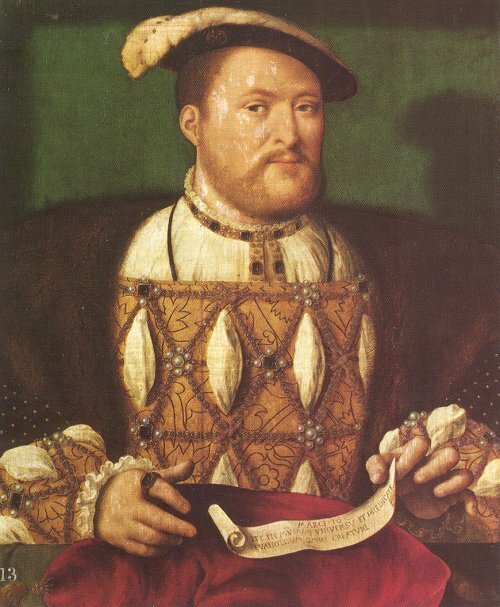 Henry VIII, c1536, after Hans Holbein the Younger. This portrait is a copy of the Holbein portrait above. It is held by the NPG, London but I don’t know if it is currently displayed. Dynastic Portrait: The Whitehall Mural, by Remigius van Leemput after Hans Holbein the Younger, c1667. 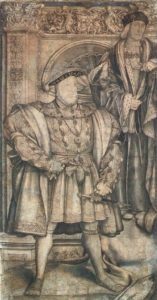 In 1537, Henry commissioned Hans Holbein the Younger to create a mural of the Tudor dynasty to commemorate the birth of his son and heir, Edward. It was the only mural which Holbein made in England. It originally occupied an entire wall in Whitehall Palace, which had been designated the official residence of the monarch just a year earlier. The mural was destroyed during a palace fire in 1698. Luckily, King Charles II had already commissioned a small copy thirty years before by the Flemish artist van Leemput. I have also provided a black-and-white scan. This ink and watercolor cartoon can be viewed at the NPG, London. It gives some insight into the overpowering experience of viewing the mural. Henry VIII and the Barber-Surgeons, 1540, by Hans Holbein the Younger. This painting was commissioned by the Barber-surgeons and has since been damaged and altered. 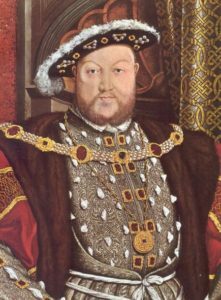 I have cropped the figure of Henry VIII from the painting. Henry VIII, c1540, after Hans Holbein the Younger. This portrait is often mistakenly attributed to Holbein. There are actually very few portraits of Henry VIII which can be attributed to Holbein with complete certainty. Those portraits, however, were impressive enough to influence all other artists who painted the king. And so most of Henry VIII’s portraits appear Holbein-esque even when they were not actually painted by Holbein. Consider this portrait – the figure of Henry is clearly derivative of the Holbein mural above. The king faces us directly, one hand clutching a glove and the other resting above a jeweled sword. The rings on his fingers are similar as well; the most obvious difference is the color of his sleeves. This portrait can be viewed at the Galleria Nazionale d’Arte Antica in Rome. When I first visited that museum, the last thing I expected to see was a portrait of Henry VIII; it was a pleasant surprise. 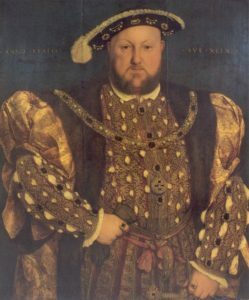 Henry VIII, c1540, after Hans Holbein the Younger. This full-length portrait of the king (once again, we have the familiar Holbein pose of one hand clutching a glove and the other resting above a jeweled sword) is part of the Royal Collection. 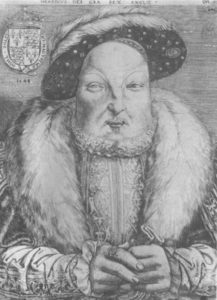 Henry VIII, c1540, after Hans Holbein the Younger. This is another anonymous portrait clearly inspired by Holbein’s work. Henry VIII, c1542, unknown artist. 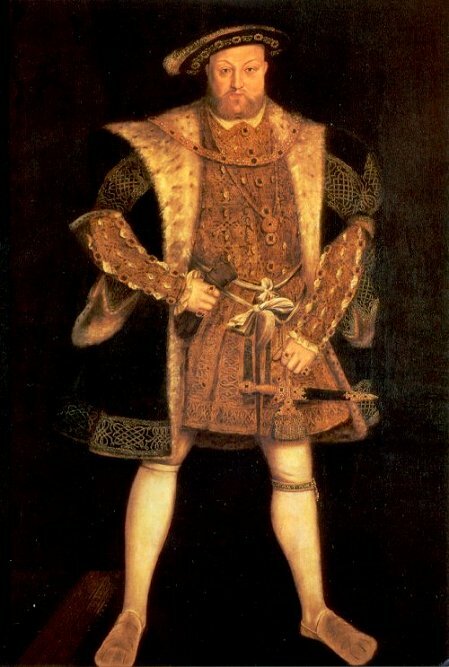 This portrait is most remarkable, I think, in its depiction of Henry’s apparel. It is quite different from most portraits of the king. The jewelry, lavish embroidery, and fur are proof of Henry’s great wealth and authority. It was painted during his brief marriage to his fifth wife, Catherine Howard. It can be viewed at the NPG, London. Henry VIII, c1545, by Hans Eworth. 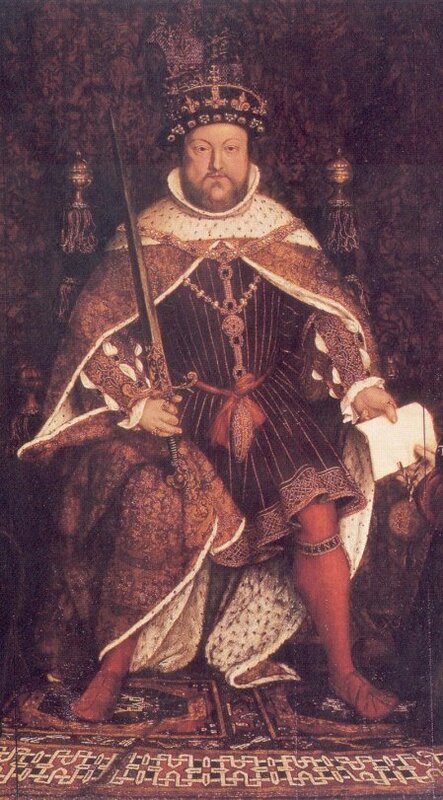 This full-length portrait borrows much from Holbein’s iconic portrayal of Henry; the king stands in the familiar pose (yet again, we have one hand clutching a glove and the other resting above a jeweled sword.) 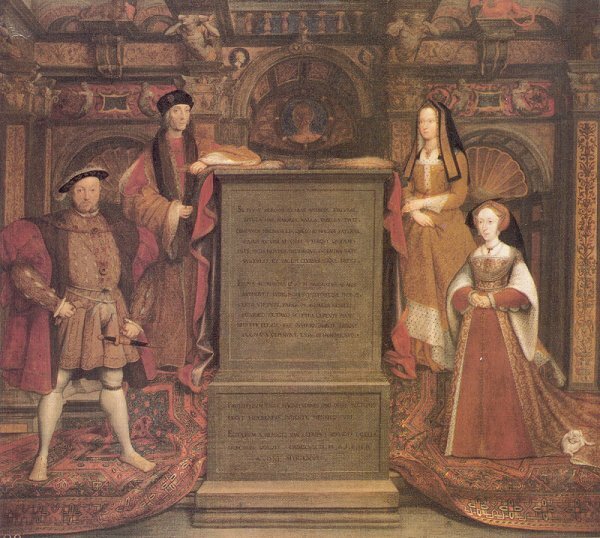 Eworth was the favorite court painter of Henry’s daughter, Queen Mary I. Note: The source for this portrait identifies it as by Eworth; it currently resides in Merseyside. I know it looks remarkably like the Walker Art Gallery’s Holbein full-length portrait of Henry. Either the source is incorrect, or Eworth copied his portrait directly from the Holbein work. The latter is perfectly possible. As written above, Holbein’s work was very popular and influential. And you have already seen the number of anonymous portraits inspired by the Whitehall mural. You can click here to visit the Walker’s website dedicated to their Holbein portrait. It was created as support for their ‘Henry VIII Revealed’ exhibit in winter 2003. Henry VIII in old age. This anonymous engraving is an unattractive but accurate portrayal of Henry in his mid-50s. 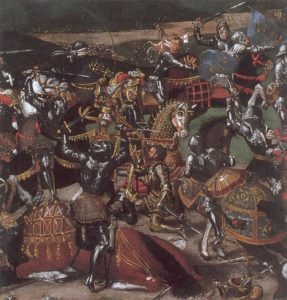 The Battle of the Spurs, 1513. This is a cropped detail from the painting which commemorates an English victory against France. It was during this campaign that Henry’s close friendship with Cardinal Thomas Wolsey began. 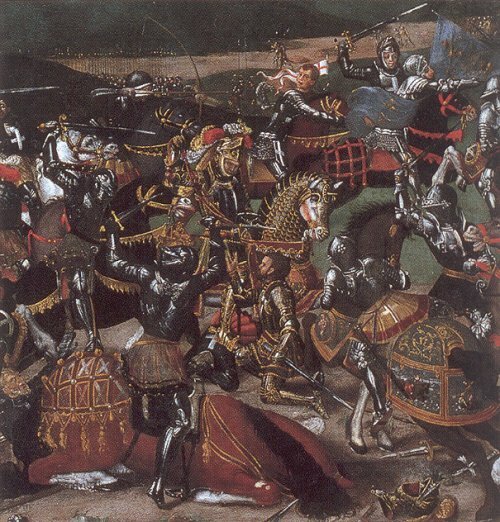 Henry’s figure is in the center, accepting the surrender of a French lord. The Field of the Cloth of Gold, 1520. This painting commemorates the historic meeting between Henry and King Francis I of France. Henry’s figure can be seen riding to the left, wearing a vivid red and gold outfit.